The 43.1m motor yacht Makira is the latest recruit to the charter fleet at CSO Yachts with charter manager Elsa Bosi. Delivered by Italyachts in 2010 to a design by Andrea Bacigalupo, Makira sleeps up to nine guests in a master suite, VIP stateroom and a double and twin cabin. 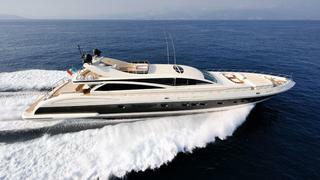 Triple 2400hp MTU engines give her a cruising speed of 30 knots and a top speed of 35 knots. Makira has a Jacuzzi, the latest sound systems and a wide selection of water toys, while zero speed stabilisers make her ideal for first-time seafarers. A shallow draft enables Makira to negotiate even the trickiest waters of the Bahamas where she's available this winter at rates starting from $170,000 per week under MYBA terms.